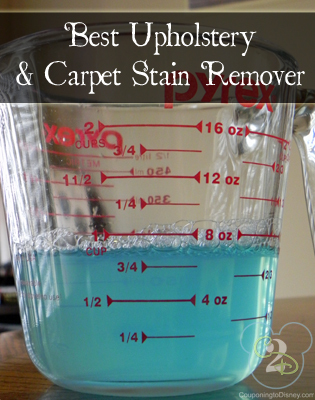 While I was browsing Pinterest a while back, I came across a picture saying this was the best carpet stain remover ever. So I pinned it. I don’t really have any stains on my carpet because I have a carpet cleaner, but I knew I might need this concoction at some point. Well, as it turns out, the arm of my loveseat ended up getting a few stains on it. So I wondered if this stuff would work for upholstery, too. This is honestly the BEST stain remover I’ve ever come across! Since I was only using a little bit, I didn’t make 2 cups worth like the original “recipe” calls for but instead cut it in half. I accidentally poured out what was left over instead of keeping it, so I can’t tell you how long it is good for. I’m not sure. So next time you have a stubborn stain, try this stuff! It REALLY works! Sprinkle baking soda on the stain and wait 10 minutes. Then vacuum it up. Mix the dish soap, vinegar, and water together. With a clean cloth, start dabbing the stain remover on the stain. Keep blotting until it’s completely gone. Check out this tip on how to make Homemade Oven Cleaner that won’t take your breath away! Be sure to also check out these other Cleaning Tips. I specified commercial interior furnishings and fixtures for a living. Capture Carpet Cleaner, created by Milliken, a huge commercial carpet mill, is my go-to product. I’ve used it consistently for 20 years, occasionally testing newbies on the market against it. It is obviously not “natural” (is Dawn?). I post this specifically for the baking soda naysayers. Don’t knock it until you’ve tried it. You could discover more about the chemistry of carpets and cleaning products, baking soda included is different from your imagination. Carpets are ALL chemical, unless you can afford wool. The real trick is to know your fiber. Operate from there. As for the homemade recipe, will it get out old stains? I’m talking OLD stains! This is a wonderful recipe that I have used on many surfaces and fabrics. It works every time and I wouldn’t change it for anything. I expect that do-it-yourselfers probably resist the idea of using a commercial product but on this topic I am going to suggest just that. I have been in the cleaning business for many years and so I am attuned to what products are sold that really work as well as what hints I can glean from a good site like this so as to make my own. I have written the company a few times to express appreciation for the excellence of their product, along with my war stories of some of the ‘impossible’ stains it has completely removed. Three examples: 1. Hurrying to polish my shoes I dropped a big blob of creamy black shoe polish on my new white bathroom rug. It all came out. 2. In my apartment hallway someone spilled two inches of a mound of some kind of awful black icky stuff. Given that the tired manager was not going to bother with it I raced for my Folex. before anyone walked on it and spread it. It took some doing but it all came out. 3. I got a blob of yellow highlighter on a new and very expensive cotton knit nightgown. Yep, it worked. The instructions say to spray it on the problem and then rub it in with your finger. Can you imagine how resistant I was to do that the first time I used the product? Gulp. Worked like magic. The Folex company does not advertise. It doesn’t need to. There are enough customers like me who spread the word. If you live somewhere the product is not sold (perhaps in smaller places) ask someone who lives in a city to send you a bottle. In the Seattle area Target stocked it. It may be available to order online. I haven’t checked that possibility. Is folex ok to use in a carpet shampooer? Yes !!! Folex to the rescue !!! When we had new carpets installed, the installer had a bottle of it with him and he showed us some of the miracles it could do on the carpet that we were NOT replacing. I am looking for a cleaner to remove pet odor, including dog urine, from a cloth couch. Love my couch and need these odors gone! Nature’s Miracle. It really IS a miracle! Make sure you pour or spray on enough to completely saturate the urine spot. Once the Nature’s Miracle dries completely, the odor will be completely gone, and the dog will not return to the spot. Vinegar and water removes pet urine odor. Use a spray bottle, spray it on, wait a few minutes and blot dry. Same for carpets. Blot up urine, spray and blot again. Vinegar also removes soap residue from laundry. Use in final rinse. Once it dries you won’t smell a thing. Call me crazy but I use it for most everything. It’s cheaper and it works. I do not find that vinegar works well for removing pet urine odors – especially for cats. The carpet or upholstery ends up smelling like vinegar which is very close and I think stronger than the pet urine (unless your cat is whole, then nothing beats the smell of the hormones!) The cats end up being very attracted to the spot smelling like vinegar and the cycle goes on! There are only two items I find get rid of urine odors for cats, and if it can do it with cat urine, dog urine is a cinch. One is “0 odor” and the other is “virastat” (not sure of spelling). If a stain just happened, don’t touch it, pour salt over it and let it dry thoroughly, even overnight. Then vacuum up. Even red wine will come out without a stain. Great discussion! I have orange linen sectional couches which are over 30 year old – they were quite expensive when new and still good (part is a sofa sleeper) but I have stains and whitening spots where I did clean with upholstery cleaner. The color also runs (of course). I love it and have some inadequate slipcovers for it but I would really like to clean it. Any suggestions or recipes? I know I’m late to the game to answer your question, but here it is… baby wipes, huggies is my favorite. When ever I clean my carpet and upholstery with anything I follow up with a vinegar and water rinse .it takes away the sticky residue left by cleaners. Leaving dish soap on furniture or carpet is a recipe for disaster, the soap will attract dirt and “hold” it. Weigh it down with something heavy. Stain will be gone. Then wipe with white vinegar and water. Best stain remover ever.got this from my new carpet directions on how to get Stains out. And you don’t have all that soapy dawn and messy baking soda. The only thing I use baking soda is for baking! how much do you mix together of each mixture? Good advice!! I can’t imagine baking soda on my carpet, let alone dawn soap! Sounds like an awful idea! Any good stain removers for clothes? I use a solution of 2 parts hydrogen peroxide and 1 part regular dawn dish detergent (2:1 ratio). Shake, spray the stain, let sit about 5 minutes depending on the stain type, drop into the wash and done. I keep plenty mixed and ready in the original peroxide bottles (the bottles are dark and works best because it loses potency when exposed to light). I put a sprayer on mine so I just shake and spray. But squeezing it out the bottle works well too. I have found this works great for all kinds of tough kids stains. Holy Crow! You NEVER EVER mix ammonia and peroxide. Not only can that start a fire, the fumes will melt your lungs! Foolish people giving advice when they know nothing about chemistry! Ammonia is toxic. We prefer to use nontoxic in our home. Vinegar, baking soda and thieves cleaner along with other essential oils from young living is all we use for cleaning everything!! Amonia takes my breath away, therefore, I don’t bother buying it.. But ammonia is one of those toxic chemicals we’re trying to get away from. Dawn with vinegar and water worked like a charm for me!! !